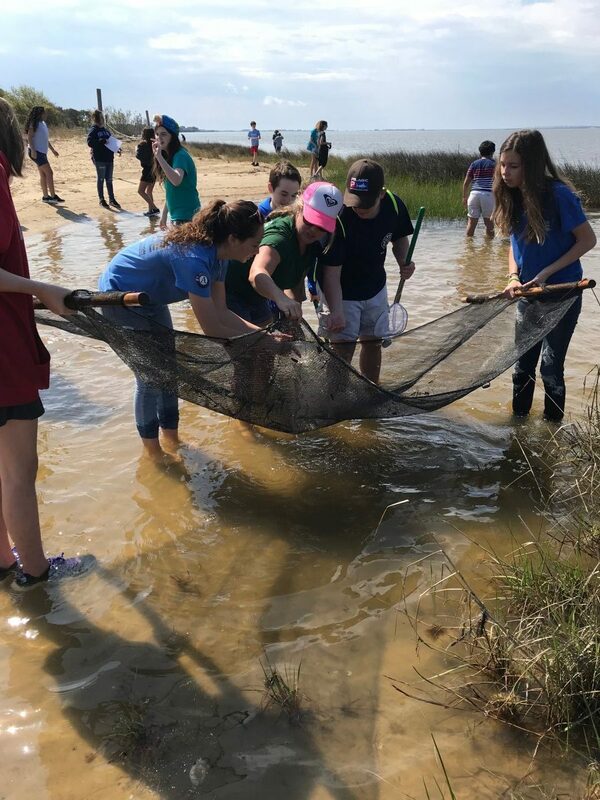 Over the course of four days, staff at the federation’s Wanchese office educated approximately 600 students on living shorelines, marine debris, water quality and much more. 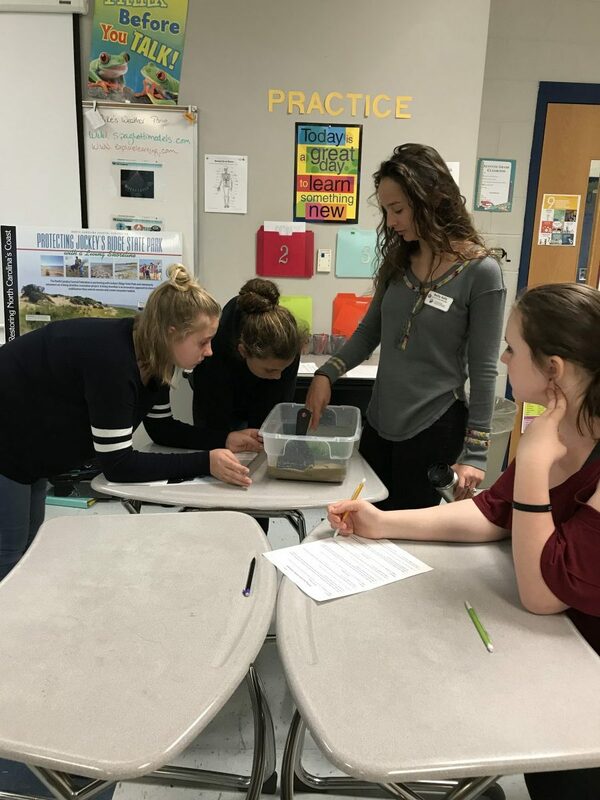 The week full of education events kicked off at Manteo Middle School on April 24 and 25, when Sara Hallas, coastal education coordinator, and Reilly Kelly, AmeriCorps member, visited seven seventh grade classes and led multiple lessons, including the shifting shorelines activity. 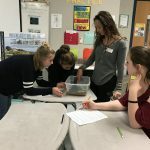 For this lesson, the students worked in groups to conduct a wave experiment on the example shorelines set up in small plastic bins. 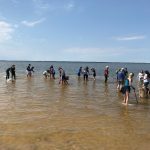 This demonstration allowed them to look at the differences between a sand only shoreline, a bulkhead, a grass shoreline and a living shoreline with oysters and marsh grass. 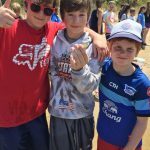 The students made a prediction of the erosion that may occur, conducted a wave experiment and measured any erosion that occurred. 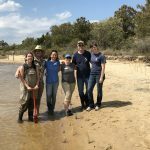 This lesson demonstrates that living shorelines stand up to waves better than sand-only shorelines or hardened structures. The students also measured salinity in a water sample and explored how this measurement might change during weather related events. They also brainstormed the top five most commonly found marine debris items on the northeast coast, and ranked them in order of abundance. 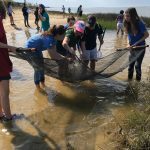 “Many of these items are commonly used items such as single-use plastics, demonstrating the importance of reducing, reusing, refusing and recycling on coastal health,” Hallas said. 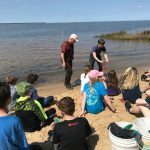 The programs at Manteo Middle School are part of a water quality project grant from the North Carolina Community Foundation. 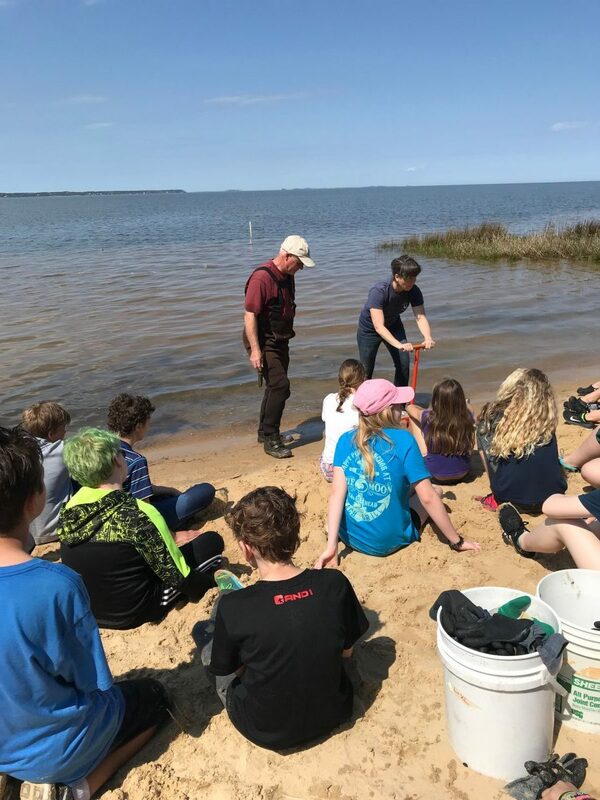 The next day, Hallas and Kelly assisted with a program at Jockey’s Ridge State Park for 140 eighth-grade students from Camden Middle School. 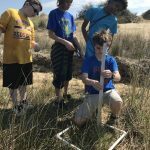 On Friday, the entire Wanchese staff ventured to Jockey’s Ridge State Park with about 220 sixth-grade students and 10-12 teachers from First Flight Middle School. 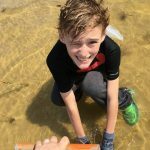 The students spent half the day exploring the visitor center and learning about animal adaptations, survival techniques and camouflage. Jason Brown, park ranger, and Michael Flynn, coastal advocate at the Wanchese office, led these lessons using local species as examples. Michelle Clower, coastal specialist at the Wanchese office, led a lesson on the top 20 marine debris items found on the coast and ways to reduce the impact of these items. 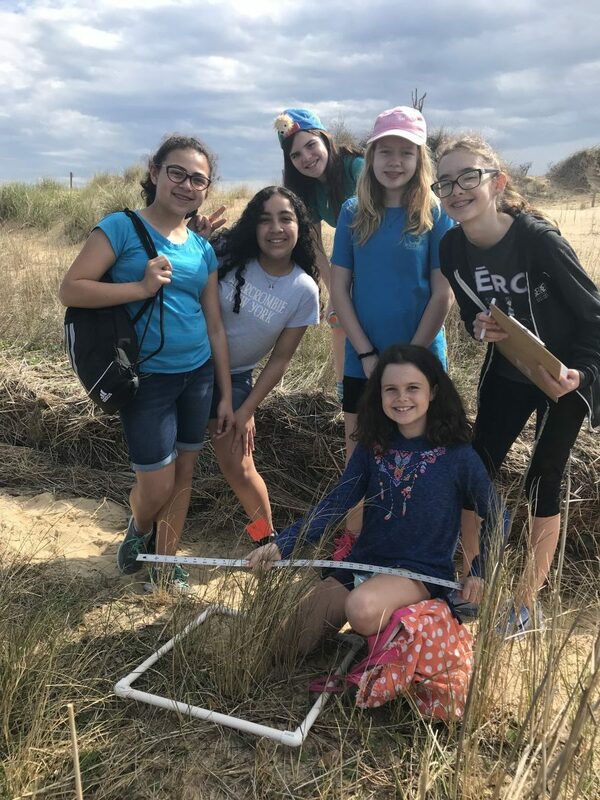 For the third activity of the morning, they learned about the mineral components of the sand dune. This part of the lesson was led by Ernest Boyce, volunteer, and Cyndy Holda, volunteer and member of the federation’s northeast region advisory committee. 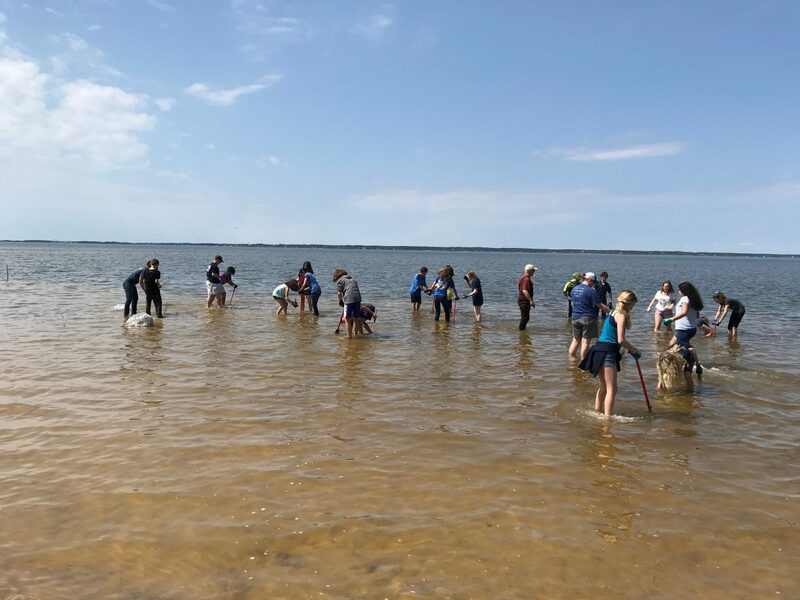 The students and teachers spent the second half of the day on the federation’s living shoreline project at the park, where they participated in a mock monitoring activity. Kelly, along with Liv Cook, member of the federation’s northeast region advisory committee, assisted Hallas during this part of the lesson. 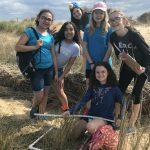 The students also helped with additional marsh grass plantings in Phase II of the living shoreline project. 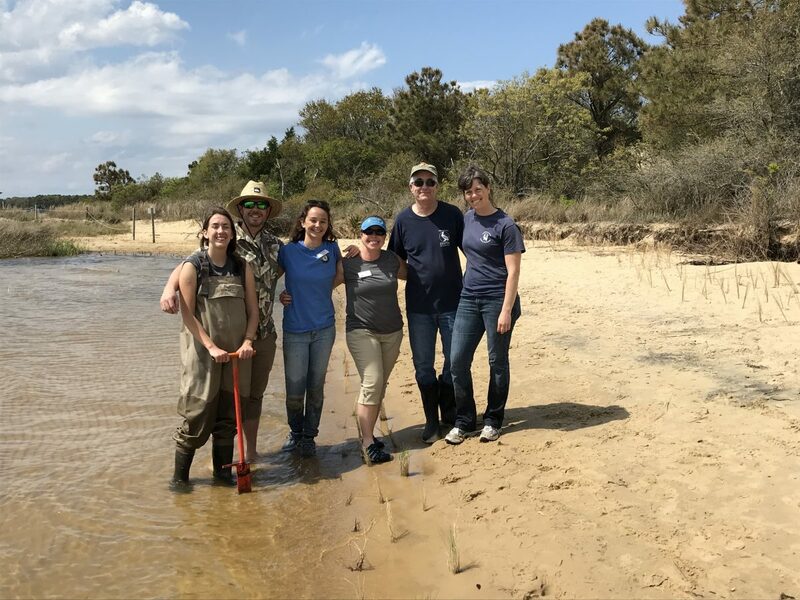 Erin Fleckenstein, coastal scientist at the Wanchese office, led the planting. A total of 3,000 plugs were planted. This included 750 plugs each of black needle rush, smooth cordgrass, saltmeadow hay and salt grass. Terry Glidden, volunteer, assisted Fleckenstein with the plantings. Hallas said she is thankful for all of the hard work from the students and volunteers. Check out this photo album from the four days! 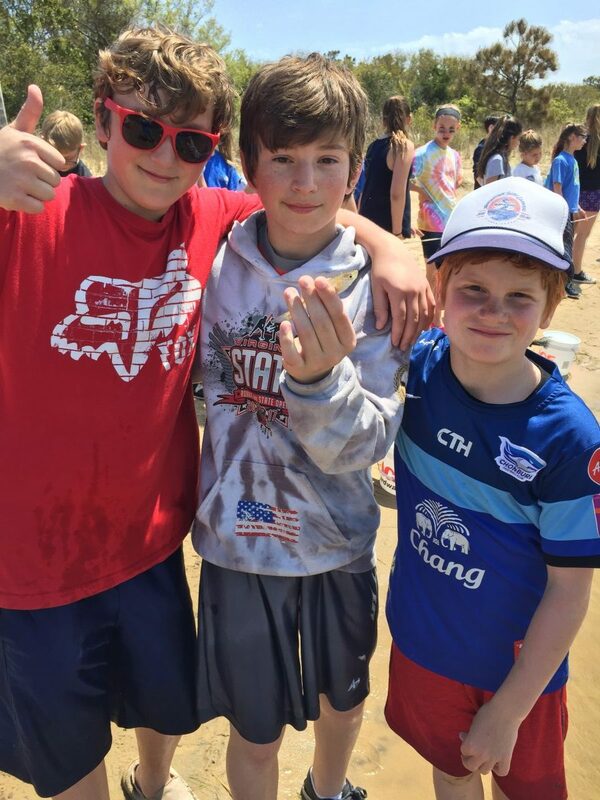 Students show off their finds from exploring the shoreline. One student puts the marsh grass in the sand while the other uses the dibbler to dig a spot for the plant. 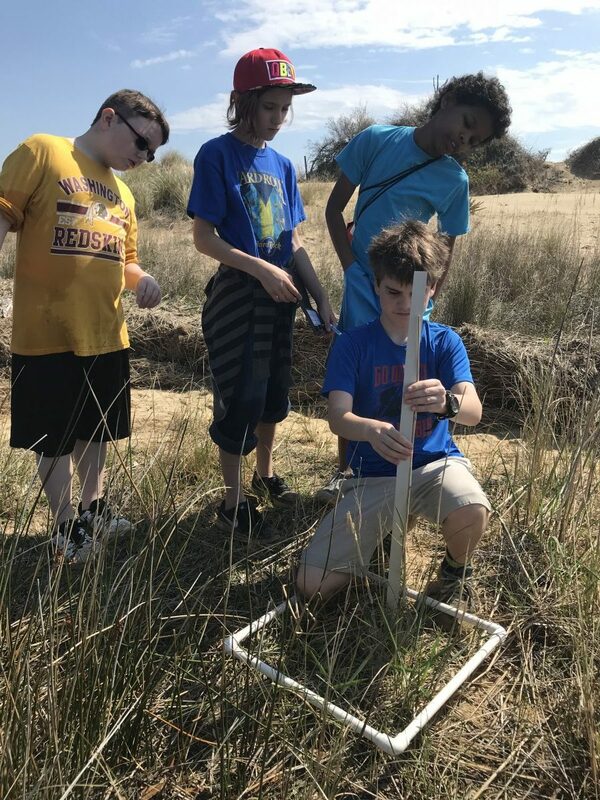 The students are shown using dibblers to put marsh grass on the living shoreline. Erin Fleckenstein, coastal scientist, demonstrates how to use the dibbler. 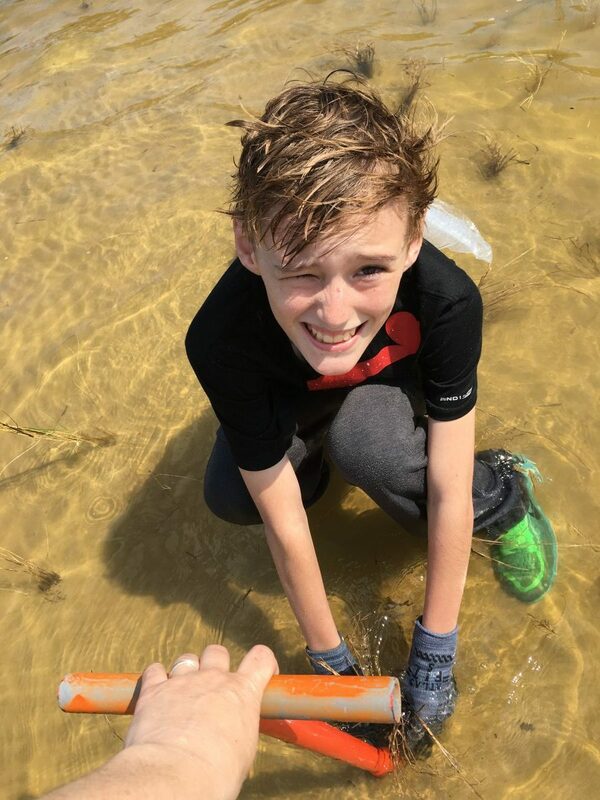 Students went seining to find out what lives in the living shoreline. The park staff were great support during the living shoreline construction work. Monitoring the shoreline helps determine how much the shoreline has grown over time. More students are shown here monitoring the shoreline. Reilly Kelly, AmeriCorps member, leads the shifting shoreline lesson at Manteo Middle.